Earlier this year, Elaine Fernandez, President of Warrior Productions and the Founder/Director of the Hudson Valley Playwrights, challenged four playwrights to write a series of loosely connected plays. 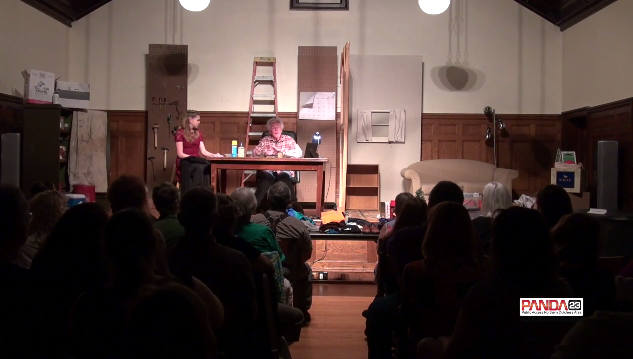 The plays were part of a larger multi-media art show depicting life for the average middle class family from the 1950s until present time. We were each given a season and a time period. My season was winter and my time period was current times. Our goal was to write a play that reflected the middle class in the season and time period we were given. My play, The Note, was written for this challenge. Please enjoy watching it here. The talented actors are Jillian Nadiak playing Joni; Wendy Uban Mead playing Bertie; Farrell Reynolds playing Phil Phillips, and Susan Gies as Marge Phillips. The play was directed by Thomas Webb.